Recently I embarked on what many consider to be a long and arduous journey, called graduate school. My first course, Urban Planning Seminar, was taught by Sally Levine, a local architect. During one brisk Saturday afternoon our class headed out on a walking tour of downtown Cleveland at which time each student discussed a different structure or area of the district. When the time came to discuss the building located at the southeast corner of East Ninth Street connected to the gorgeous Cleveland Trust rotunda, many smiles turned to frowns. The structure's appearance is not loved by all, however it is architecturally significant to be sure. The structure was designed by Marcel Breuer who was born in Hungary in 1902. He is considered one of the masters of Modernism, and he displayed interest in modular construction and simple forms. Breuer designed the 1971 expansion of the Cleveland Museum of Art. 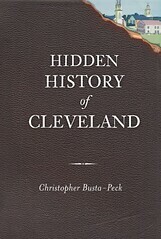 Brock Weir of the Cleveland Trust Bank was a trustee of the art museum, and he recruited Breuer to design what at that time was called The Cleveland Trust Tower. 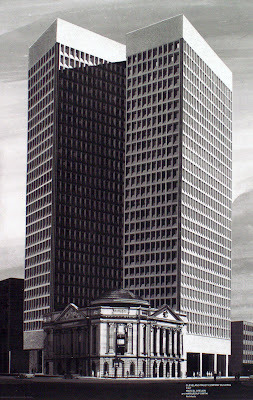 The following photo provided by clevelandskyscrapers.com illustrates how it was originally designed to have twin towers flanking the bank's 1908 rotunda. Although my instructor defended the importance of the Ameritrust Tower during our class walking tour that day, she did not elaborate on her involvement with it. It was until a few weeks later on facebook that I stumbled across her name as someone who was being hailed a "savior" of the Breuer building. I had to learn more about the preservation efforts, as so few are successful here in Greater Cleveland. Sally was kind enough to grant me an interview laying out the history behind Marcel Breuer's only constructed skyscraper. 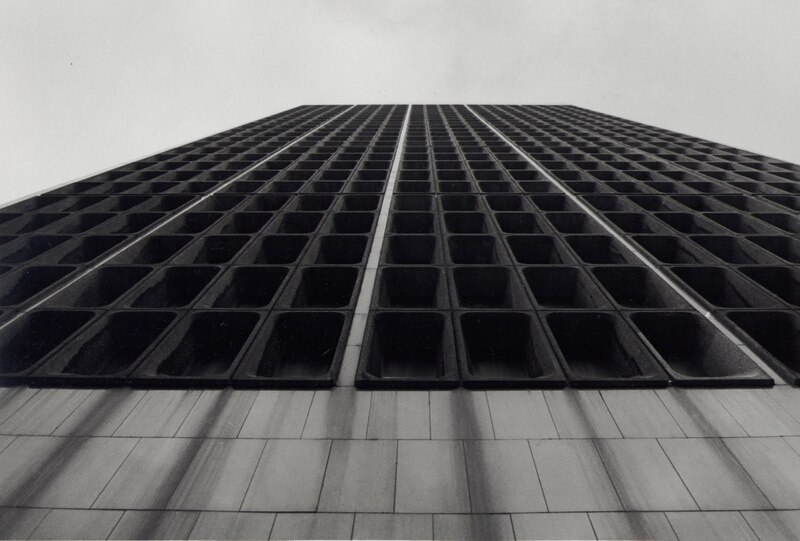 Marcel was known for using an architectural style called “Brutalism.” Can you expand on that concept, and would you consider the Ameritrust tower to be of this style of architecture? The short answer to the second half of your question is “yes, the Ameritrust Tower is an example of Brutalism.” Expanding on the concept will take a bit longer. The term “brutalism” comes from the French phrase “béton brut” which translates into English as “raw concrete.” Many 20th century Modernists worked with concrete – both as a structural material and as a façade facing. Concrete’s inherent plasticity made it a favorite material for architects who were interested in the sculptural aspects of buildings. Brutalist buildings are characterized by their monochromatic palette; their materials are unadorned - the beauty comes from the natural expression of the concrete, the stone, the glass and the steel. The Ameritrust Tower shares these traits. Its façade creates a pattern that serves as a backdrop for the Cleveland Trust Rotunda building, a neo-classical work by architect George Post. The pre-cast concrete window surrounds create the modulated pattern and are dimensioned to provide shade from the sun during the hot summer months and to allow sunlight to enter during the winter. Did you see the tower being built and if so, what did you think about it as it was going up? If not, what was your impression of the building when you saw it for the first time? The first time I saw the building I was definitely intrigued by the structure and its form. I was - and continue to be - a Breuer fan. The building has been vacant since 1992, when did preservation efforts begin and why? The efforts to save the building began when Cuyahoga County announced its plans to raze the tower and build a new county administration building on the site. The project would have saved the rotunda building, which is on the National Register of Historic Places. Steven Litt wrote extensively on this issue, and at first, he was the lone public voice in favor of saving the building. Also – at just 39 years old, it hasn’t reached the magic 50 years required before it can be considered for landmark status. What types of efforts took place to save the building, and how were you involved? What other groups were involved and what was the final outcome? I’ve read that there was a large amount of asbestos to be removed from the building. What were the implications there as far as the effect that would have on the building’s demise? It’s true, there is a great deal of asbestos in the building. The issue must be addressed whether it remains standing or is torn down, so the cost is a wash. If the building is reused, the asbestos can be encapsulated. Why is it so important to save this structure when so many people believe it to be an eyesore? • Styles come and go – and it’s too early to make any decisive evaluations at this time. People in the Renaissance hated Gothic architecture. Today, we are grateful to have examples of both. • Cleveland does not have many buildings by world-class architects, and having 2 Breuer buildings, the tower and the addition to the art museum, makes the city an important destination for Breuer scholars, architects and other interested parties. • Breuer was an important mid-century modern architect, and this tower is the only one of the high-rise office buildings he designed that was built. His portfolio includes a wide range of building types: homes, museums (the Whitney Museum, NYC), government buildings (HUD Headquarters, Washington DC), university buildings (U of Massachusetts Campus Center, Amherst, Massachusetts), religious structures (St. Francis de Sales Church, Muskegon, Michigan). Additionally, he designed some very significant pieces of furniture, in particular the Cesca and Wassily chairs. He was the first to bend tubular steel for his furniture – and he got the idea from seeing the handlebars on his son’s bicycle. • This tower, like many throughout the nation, has embedded energy – i.e. : the “bricks and mortar” used to build the structure are already in place, and the energy used to create the materials has already been expended. From a sustainability standpoint, there’s no question but to reuse an existing building, even when the new building is being touted as “green.” There’s no way that a new building can have less of an impact on the environment that an existing on. Also, even if it costs the same to renovate an existing building as it does to raze and build a new one, it is always better for the local economy to renovate. The monies used in renovation largely go toward labor, which stays in the immediate area. In a new building, much of the expense goes for the materials and those suppliers are often not in the local area. What do you think the future holds for this structure, and if anything, what would you like to see the building be used for? I thought the idea of a hotel, with the rotunda as the lobby and the tower for the rooms, was a great idea. I hope that the building is saved – although not “preserved.” I believe it can be adapted to a new and useful purpose – and I would be thrilled to be part of the process. We may need to wait until the economy recovers before we see how the saga unfolds. The county currently owns the site, and is trying to sell it for what they paid along with improvements costs. According to this article in the Plain Dealer, they likely will not receive the current asking price. I certainly agree that the building should be saved. It's not the prettiest, but the "Brutalism" style is quite appropriate for Cleveland. Clevelanders are tough and resilient, and so is this structure. Before long, we will all evolve into something spectacular. I opersonall think that one of the things that has alway hurt this building is the city grime that clings to it. It makes the windows seem hollow, lifeless. IOn the other hand, Cleveland has never embraced this structure. While Breuer is an important name, there is something dehumanizing about the structure at ground level. It does embrace you on the street level and invite you in. It always reminded me of a IBM punch card - it lacks humanity. But its still cool. We had something similar here in downtown Greensboro, NC. 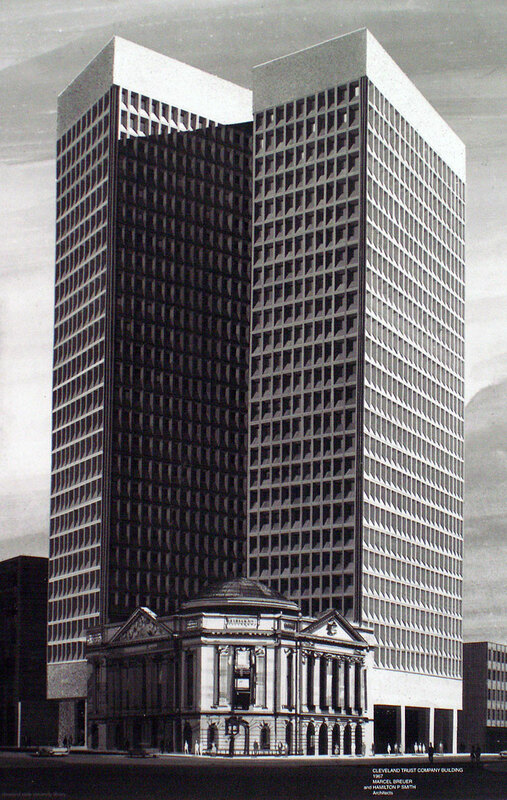 Wachovia Bank built a 17-story office building back in 1964. It didn't have a famous architect, however, and it certainly was a very undistinguished steel and glass box. It was abandoned in the early 1990's due to asbestos, just like the Ameritrust building. Not knowing the area that the Ameritrust building sits in and the fact that what works here in Greensboro doesn't necessarily work for Cleveland, I still think it would be a shame to tear down an architecturally significant building when there are ways to repurpose it. You had Ms. Levine as a teacher too! She taught my two introductory architecture classes at Case Western when I was a student there. It was a pleasure to have her as a teacher. She drew the class' attention to the Breuer Building and I recall several spirited arguments about the aesthetic qualities/importance of 'Brutalist' work in the advent of modern design and in the use of prefabrication in efficient (both in thermal and money terms) design. Destruction of existing buildings is an American past time. Why have one old one when you can have a new one for twice the price? I think improvements can be made, but a certain appreciation for great design belongs in a city like Cleveland where, although sometimes difficult to see through the grit of the place, there still exists a spirit unmarred by mass consumerism and the monoculture of new cities (like my hometown, Columbus).